"Unique nursery furniture to save you space!" How To Make the Most Of Your Space. Unique Nursery Furniture Space Saving Ideas. Other Super Space Saving Ideas. I know what it's like to have a small baby nursery to work with - my first one didn't even have a closet! "Where on earth am I going to put all this stuff?" See the nursery storage plan page, to find out how to get all the functionality and storage space you need out of these five items of furniture for the baby nursery. These five items should fit quite comfortably into even the smallest baby room. Next, follow the unique nursery furniture space saving tips below, for options to help you to squeeze more square inches from your space. Another unique nursery furniture option is a corner crib. Because of the innovative use of corner space, this crib uses less floor space than a standard crib, but still gives baby room to move! Unfortunately these cribs are now only available on the secondhand market. A crib 'n changer combo is more compact than the two separate furniture items. A dresser/ changer combo gets two jobs done with one piece of unique nursery furniture, saving you between six and eight square feet. Corner changing tables are great for using up those awkward empty corners to get the most from your floor space. Folding changing tables and portable changing mats can be stored under or behind the crib when not in use. Neither wall mounted changing tables nor crib mounted changing tables use up any floor space at all. Changing tables with an extra hutch attachment provide plenty of extra off-the-floor storage space. 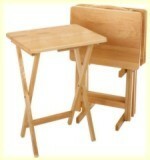 For more information on saving space with baby changing tables, click here. Another unique nursery furniture item to save space in the baby nursery is a folding tv tray like this one from Amazon.com. Use it to hold your tissues, baby's pacifier and bottle etc. while you are feeding. 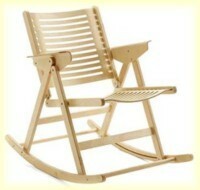 Fold it up and stow behind the nursery rocker when you are done. Note that in this case, you will need to find an alternative location for your nursery lamp - maybe on a shelf higher up? Tuck your basket of feeding goodies (bibs, burpcloths etc.) 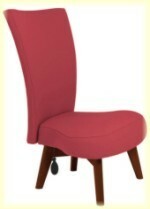 beside, or under, your rocker or chair. Try a simple wooden rocking chair, instead of a padded and upholstered nursery glider. They are much narrower, and the footstool that comes with them can be tucked under the chair when not in use. Obviously, the ottoman that comes with a nursery glider has to stay in front of it when not in use, due to the glider mechanism under the chair. Or, if you are really short of space, the folding rocking chair is a unique nursery furniture item that can be stored against the wall or behind the nightstand. Add your own coordinated pillows for comfort and homely appeal. Alternatively, you could consider a straightforward chair for nursing baby. Chairs without rocking or gliding mechanisms tend to be smaller. Make sure the chair is comfortable and try to find a padded one. A laundry bag, easily accessible from the baby changing table, will work just as well as a baby hamper, and can be hung from a shelf with pegs or from hooks in a door, giving you one to two square feet of extra breathing space. If you can't find a nice one to match you nursery decor it's easy to make one yourself. Dimpleanddandelions.com have absolutely gorgeous nursery fabrics available by the yard. 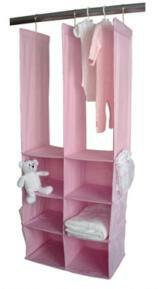 Another item of space saving furniture for the baby nursery is the baby armoire. 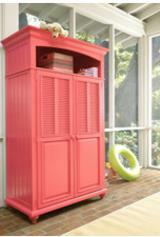 Armoires offer more storage space than dressers for the same floor space. Some are made with a low hanging rail with shelves above to maximize storage options. Many also have easy access drawers at the bottom. Many toy boxes double up as bench seats - extra functionality for the same amount of square feet is always a good idea in a small baby nursery. 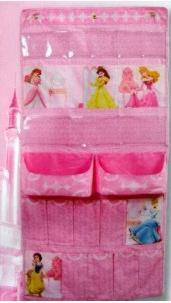 To save more space use a toy bag that you can hang from a shelf or behind a door, instead of a toy box. Again, if you can't find one to suit your baby nursery design, buy a yard of fabric from Dimpleanddandelions.com and make it yourself. 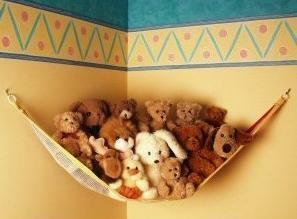 If you've been overrun by the soft toy brigade, a toy net is a great space saver. I had one in my first nursery, and it just never seems to get full. The more toys you add, the more it stretches! If you have a closet in the room, consider installing a closet organizer to optimize the storage space. This may save you from buying that extra dresser or toy box furniture for the baby nursery that you really do not have space for. This one is really inexpensive at only $28! Hanging baskets are a great storage idea. They can add character and charm to your baby nursery without cluttering the floor. Make the most of the space on the back of your baby nursery door, with a hanging organizer. These come in many different colors and styles, and are perfect for storing the overflow of stuffed toys. Toddlers love them too! Csnbaby.com and ababy.com have wonderful nursery shelves to fit almost any nursery design. Another unique nursery furniture item - check out this diaper shack.. Hang this above your baby changing table to increase storage without decreasing floor space. Visit yard sales and used furniture shops and look for an old coat stand. This can be refurbished to make a unique nursery furniture item to match your baby nursery decor. Place it in a small unused corner, and hang bulky winter coats and hats here that take up a lot of basket space. Now that I've given you a few ideas, make yourself a cup of tea, take a comfortable chair and "visit" with your baby nursery and your floor plan. Look for nooks and crannies in corners, under the eaves, on the walls. What about at the end of the crib - will there be space for a hatbox or two?